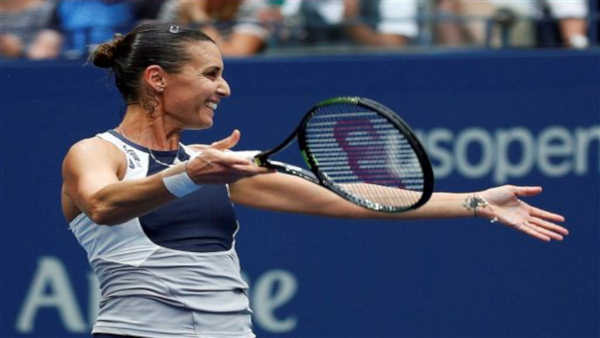 FLUSHING -- Talk about going out on top: Flavia Pennetta won the U.S. Open for her first Grand Slam title at age 33, and then announced during the trophy ceremony she has decided to retire. "This is how I say goodbye to tennis," Pennetta said as her fianc, tennis player Fabio Fognini, captured the scene with his phone's camera. "I couldn't think to finish in a better way." They grew up 40 miles (65 kilometers) apart in coastal towns in Puglia, a region on the heel of Italy's boot-shaped peninsula, and have been facing each other on court for two decades - with the stakes much lower, of course. They shared some laughter and tears in the locker room together Friday while watching a video of a TV interview they did back in 1999, when they won a junior doubles title at the French Open as teenagers.